What is the Outlook for Germany’s Healthcare by 2020? Juliane Zielonka (in center) guided an expert panel on the future of Germany’s Healthcare system. Founded in Silicon Valley in 2009, Health 2.0 is a international organization dedicated to health innovation and made up of 90 chapters. The Berlin chapter has over 1000 members from healthcare, insurance companies, the pharmaceutical industry, startups, and eHealth enthusiasts. 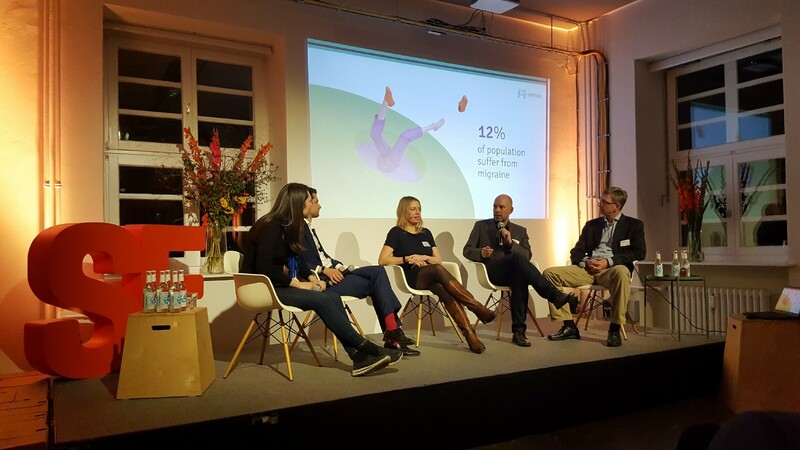 On October 25th, 120 interested people gathered at Spielfeld in Kreuzberg, Berlin to hear a forecast of the German healthcare system over the next 3 years. The Berlin Health 2.0 chapter event panel represented a wide spectrum of players in German healthcare: Yvonne Gründler from a totally new digital private health insurance company; Jonas Pendzialek, a consultant for digital health transformation of public insurance; Markus Dahlem who cofounded an app for headache treatment; and pharmaceutical veteran, Dr. Hardy Kietzman. Together they painted a picture that was both encouraging and honest. Although huge inroads have been made, the path to more measurable advances in digital health is still very much under construction and requires major collaboration. After a warm welcome by Berlin Health 2.0 organizers Juliane Zielonka and Ulrike Anders, we heard from Dr. Karsten Neumann. As a senior advisor at Roland Berger, he debunked the notion that digital healthcare might be dead. Yet he also acknowledged why that particular doubt still exists. Neumann asked us: Why do people in Germany think that so little has been done in the last 20 years since the term digital health came about? It seems to be linked to the slow progress of the Electronic Health Record (EHR). According to Neumann, Germany’s spending on digital health has been much less than that of other highly-developed countries. He says symptom checkers have not been satisfactory, and neither has the default answer of “We have an app for that,” by many companies. But he notes movement in key areas of artificial intelligence (AI), particularly in the fields of pathology, radiology, and mental health. Some promising spots where AI works very well is in lifestyle coaching, especially weight loss and diabetes care. He mentioned key new players in the health market such as Ada, and indicated there is a race to ‘steal the patient,’ so expect further patient-centric solutions as well as voice and dialogue-based technology. Karsten Neumann explains how the uptick in digital health advancement took so long to kick in. Juliane Zielonka then expertly guided this panel of four with insightful questions to spark answers on what success they’ve had, what is holding up advances in digital health, and what they are doing to combat that. According to the first panelist Yvonne Gründler, Head of Product at Ottonova, there has been no new private digital health insurer in the German marketplace for 17 years. I am starting to see why; it isn’t easily done. Gründler’s enthusiasm for her insurance product and the digital services that orbit around it are contagious though. Ottonova offers everything in one place; they want to be ‘the glue’ that binds together all the key players around your health. In doing so, they offer assistance via a ‘concierge’, a user-friendly timeline which serves as your electronic health record, health prompts based on your timeline, document storage, and soon — digital doctor visits. The name Ottonova, literally “New Otto”, pays homage to the originator of social health insurance in Germany, Otto von Bismarck. The company aims at digital natives who are comfortable in their online skin, and tend to consume most services through that digital format. They place high importance on user experience and believe that health insurance should be flexible and modern enough to accommodate a wide variety of lifestyle structures and health needs. Gründler emphasized: Payers have a responsibility to speed up progress, or deliver solutions where pubic insurance may be much slower. Yvonne Gründler (far left) explains the historical connection between Ottonova and Otto von Bismarck. It was fitting that the next speaker Jonas Pendzialek, Digital Transformation Manager for Die Techniker Krankenkasse (TK) in Hamburg, came from the public insurer perspective. TK is the single largest health insurance company in Germany, covering at least 10 million people. In his role advising TK, he says the goal is to have a neutral app-based EHR which provides a standard even to other major insurers like AOK. Because if you want to get insights into data, he says you need to first safely collect that data someplace. What struck me was this: “The most important thing public health insurance can do is provide an electronic health record.” Pendzialek describes this as an integrated, interoperable EHR. TK is working with IBM as an external partner in this endeavor. To encourage more innovation in the digital health space, they run a startup accelerator program with various levels of awards based on the maturity and concept of each startup. They want to help startups entering the healthcare market, and improve their odds of success. Continuing the theme of innovation, Markus Dahlem presented his app, M-sense. When you consider that 12–15% of people worldwide suffer from migraine headaches, it is logical to seriously consider accessible headache treatment. Markus Dahlem (second from right) says 12–15% of the global population deals with headaches. With impressive credentials and an extensive background in theoretical physics and brain research, Dahlem is M-sense’s chief medical officer. He explained how algorithms are the key behind the digital therapeutic solution he co-founded. His pursuit of pattern formation and chaos theory led to him building computer models. Dahlem clarifies right away that the first step in headaches is getting a proper diagnosis from a doctor, who rules out any other causes. Dahlem says that generally, headaches tend to fall into two categories: tension-type or migraine. In his words, “Migraine is a chronic disease, but people who experience migraines are not always ill.” The app is about exploring these places in between migraine episodes, seeing when those occur, and what a person can do to alleviate or understand what influences symptoms. M-sense offers a lot that people with headaches can do if they are dissatisfied with their treatment plan, or if they simply want to improve their life quality. The app has a patient program via chatbot, collects data on lifestyle factors, and applies Machine Learning to discover patterns. Complete programs in non-drug methods, sports, and relaxation offer users a proactive approach to headache treatment. Dahlem reports that some physicians have been pleased to see reports generated by the app for the user, synthesizing the latest trends in their symptoms. M-sense aims to be your “digital health assistant against migraine headaches”. To round out the panel, we heard from Dr. Hardy Kietzmann, Director of Innovation at Sanofi in Germany. With his nearly two decades of experience in strategy and business development for the pharmaceutical industry, Kietzmann offered a long view on the situation. The health areas he focuses on include thyroid issues, diabetes, oral contraception, multiple sclerosis (MS), and vaccines. He told an interesting anecdote about how one of Sanofi’s most successful( i.e. downloaded) apps is about contraception, yet because no associated advertising is allowed, there is no business model. In short, the app is not allowed to sell medications to the public. He says the next step is to make apps that actually fall within the ‘medical device’ category, and not below that, despite the regulatory tape that accompanies that status. One of the areas he see as important is connecting diabetes and hospital care. For example, partnering with a clinic to better monitor blood glucose measurements. In order to facilitate more digital health advances here in Germany, we need even more dialogue among players. That means involving medical experts, policy-makers, big pharma, startups, payers, and very importantly, patients themselves. We get further by building that ecosystem. My aim is to provide a helpful summary for those who went to this Meetup, those who remained on the waiting list, or people interested in the topic of health in Germany. I welcome your comments on this outlook. 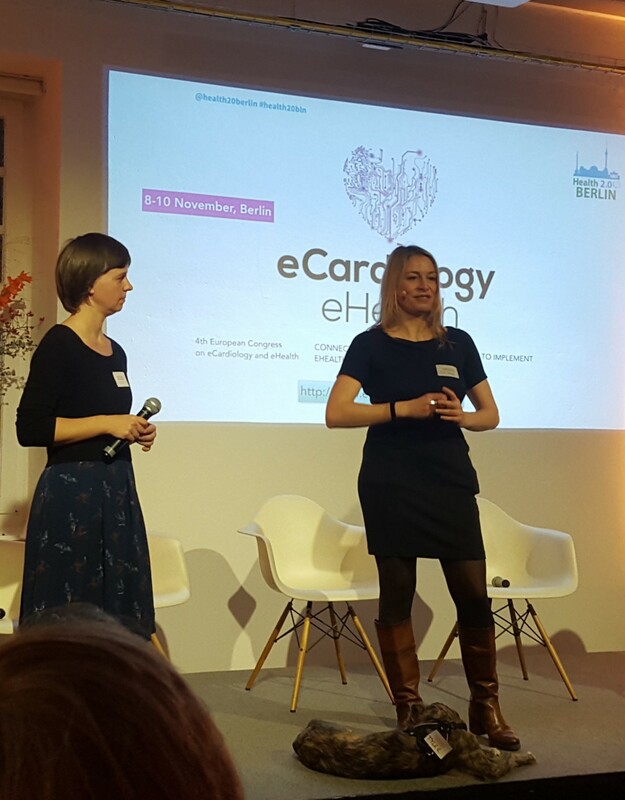 There are at least 2 great digital health events coming to Berlin in November to check out: a conference on eCardiology and eHealth as well as a massive Frontiers Health event which I will be covering. See you there! Reporting from within a Venn diagram of health, tech and empowerment. Berlin-based. Internationally minded.